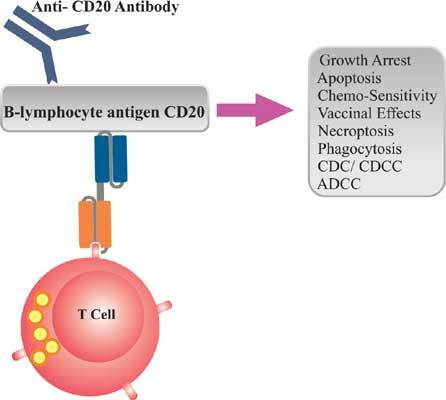 Background: CD20 is a surface antigen, which is expressed at certain stages of B-cell differentiation. Targeting the CD20-positive B-cells with therapeutic monoclonal antibodies (MAbs) has been an effectual strategy in the treatment of hematologic malignancies such as non-Hodgkin’s lymphoma (NHL) and chronic lymphocytic leukemia (CLL). Initial success with Rituximab (RTX) has encouraged the creation and development of more effective CD20 based therapeutics. However, treatment with conventional MAbs has not been adequate to overcome the problems such as refractory/ relapsed disease. In this regard, new generations of MAbs with enhanced affinity or improved anti-tumor properties have been developed. Objective: CD20 directed therapeutics have heterogeneous features and mechanisms of action. Hence, having sufficient knowledge on the immunological and molecular aspects of CD20 based cancer therapy is necessary for predicting the clinical outcomes and taking the necessary measures. Method: An extensive search was performed in PubMed and similar databases for peer-reviewed articles concerning the biology, function and characteristics of CD20 molecule as well as the mechanisms of action and evolutionary process of CD20 targeting agents. Results: This review provides information about the current situation of CD20 targeting immunotherapeutics including MAbs, bispecific antibodies (which exert multiple functions or involve Tcells in tumor elimination) and CAR T-cells (engineered T-cells armed with chimeric antigen receptors). Moreover, limitations, challenges and available solutions regarding the application of CD20 targeting treatments are addressed. Conclusion: Utilization of CD20-targeted therapeutics, due to their diverse properties, requires special considerations. Keywords: Bispecific antibody, bispecific T-cell engager, chimeric antigen receptor, antibody drug conjugate, monoclonal antibody, lymphoma, leukemia, targeted therapy. Keywords:Bispecific antibody, bispecific T-cell engager, chimeric antigen receptor, antibody drug conjugate, monoclonal antibody, lymphoma, leukemia, targeted therapy. Abstract:Background: CD20 is a surface antigen, which is expressed at certain stages of B-cell differentiation. Targeting the CD20-positive B-cells with therapeutic monoclonal antibodies (MAbs) has been an effectual strategy in the treatment of hematologic malignancies such as non-Hodgkin’s lymphoma (NHL) and chronic lymphocytic leukemia (CLL). Initial success with Rituximab (RTX) has encouraged the creation and development of more effective CD20 based therapeutics. However, treatment with conventional MAbs has not been adequate to overcome the problems such as refractory/ relapsed disease. In this regard, new generations of MAbs with enhanced affinity or improved anti-tumor properties have been developed.